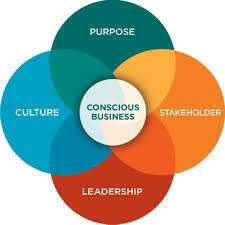 Conscious capitalism enterprises and the people are those seeking knowing of the effects of their actions and putting into action practices that benefit both individuals and the natural environment. The conscious capitalism movement in the world, which emerged in the theory of corporate social responsibility, catapults for “values-based” economical values where ideals represent social and also environmental concerns at both global and also local scales. This effort relates to not-just-for-profit business products, conscious consumerism, and also socially responsible trading or investing.